The CSXi is a compact and lightweight unit, so it is suitable for installation in small spaces and is the ideal replacement for older starters in existing motor control centres. Integrated bypass contactors simplify installation by reducing the need to select and connect additional equipment. Because the contactors are already contained within the starter, the overall size of the installation is also smaller. Bypassing the starter while the motor is running also reduces the amount of heating, so the starter can usually be installed with no additional ventilation. In addition to the benefits of soft start and soft stop, which improve the operating life and efficiency of your equipment, the CSXi also protects your motor and load from damage during operation. The CSXi models the motor's temperature to prevent against operational overload, and bypass overload protection safeguards the starter from severe spikes in current. The starter also monitors the time taken to start and will trip if the motor cannot start within the allowed time, protecting against stalled loads. The CSXi also protects against fluctuations in mains frequency and current, as well as incorrect installation. 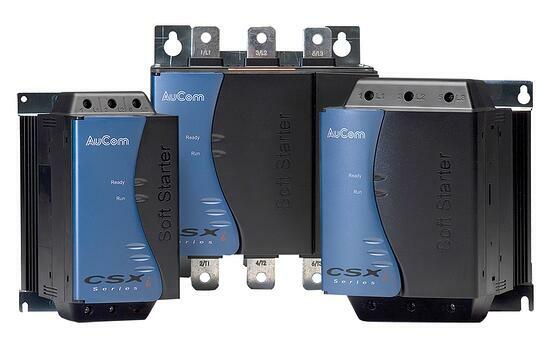 CSXi soft starters integrate into your existing DeviceNet, Modbus, Profibus or Ethernet network using easy-to-install plug-in communication interfaces. The optional remote operator can be installed to provide remote feedback, including current, temperature and starter status. For enhanced personnel safety and protection, AuCom has developed insulating finger guards, which install quickly and easily onto 75 kW ~ 110 kW CSX Series units to provide IP20 protection.